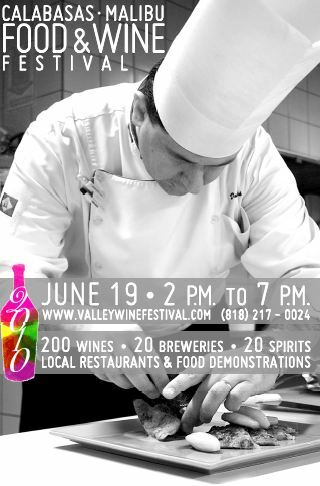 Kick off summer with the 4th Annual Malibu Calabasas Food and Wine Festival on June 19th from 2-7pm. Enjoy over 100 wineries, breweries and spirits while tasting the best that culinary masters have to offer in food. Some California wineries include Barefoot Wines, Cycles Gladiator, Ravenswood and more. Spend the afternoon indulging in world renowned chef tastings and demonstrations and sample some of their menu creations. Participating chefs and restaurants include: Chef Tommy Tang, Chef Frania Mendivil, Chef Don Alger, Chef Tyler Cyre, Chef Tom O’Brian, L’Ermitage Beverly Hills, Gladstone’s Malibu, Patina and Country Club Restaurant. The proceeds will be donated to benefit the Alzheimer’s Association and the LA County Sheriff Department. Grab your wine glass and work up an appetite for this special event! Purchase your tickets here before they sell out. Awesome! Great article! I love finding out new things about LA! I’ve been here 6yrs but still have so many things to do and see!! I’m also a writer on Examiner.com LA TV Examiner.